"Handsome New Town Hall at Todmorden Opened - Munificent Gift of Fielden Brothers"
Photography had yet to makes its appearance in the press in the 1870s - a lithograph was the next best thing. 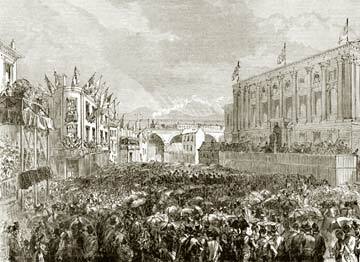 This amazing scene captured by the "London Illustrated News" shows that virtually the whole of Todmorden turned out for the opening of the new Town Hall and unveiling of a statue of John Fielden MP. Far from a click of the camera it must have taken the artist hours to draw! For many years the statue stood in front of a portico on North Street before being moved to a site near the Golden Lion, afterwards named Fielden Square. The handsome new Townhall at Todmorden, which is the munificent gift of three brothers - Messrs Samuel and John Fielden, and Mr Joshua Fielden MP - to their native town was opened on Saturday, the 3rd inst, when Foley's bronze statue of their honoured father, the late Mr John Fielden MP, was also unveiled. The statue stands in front of a portico on the North-street side of the Townhall; the pedestal is of granite and rises to a height of about six feet. The appointed Saturday was observed as a holiday in the district. Unfortunately, after the procession had started rain began to fall; but it marched to a large open space in front of the hall.